Updated Thursday August 24, 2017 by SABA IT. Saxonburg Area Baseball Association functions solely on volunteers to provide a positive baseball experience with an emphasis on instruction and development for the younger age groups and transition into more competitive play as the players' skills advance when they are older. Five of our fields and 2 concession stands are located at Laura Doerr Park. Jefferson Twp. has recently made many beautiful improvements and upgrades to the park with the help of government grants. With a public pool, fields, walking trail and large playground, it truly is one of the most beautiful parks around. Our 5 fields are always maintained and keep in safe playing condition for the kids and our concession stands are stocked with a variety of items that never lets us forget we are at a ball game. Watching baseball in our park is never disappointing but there is one thing missing. Our fields do not have lights to play after dark. We are limited to only playing when the sun is up. Adding lights to our field will open up many opportunities for our kids including extending tournament game times and hosting Fall Ball. 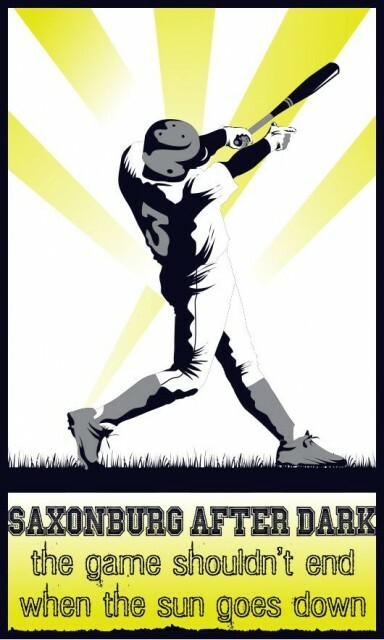 "Saxonburg After Dark" is the stepping stone to reach our goal of playing "after the sun goes down." This goal will be reached through a variety of efforts. The first being some planned events, where all funds raised will specifically go to Saxonburg After Dark. A fundraising committee is being established to help plan these events. Additionally, we will seek the help from donations and sponsorships from our community. We also have a third option, which is to apply for grants. Grants available for our organization are typically matching grants. This is why the first two options are important steps in achieving our goal. Our goal is to raise the funds to pay for the materials and through the help of our volunteers, get the lights installed. This is a BIG project, and a costly one. We will continue to look for and accept bids for the materials but the project will cost between $120,000-$130,000. The goal is to be playing under the lights in the 2018 season. Lights, poles, electrical upgrades and other materials will be purchased with these specific funds. We will save between $15,000-$20,000 in additional costs by using our parent volunteers to donate equipment, expertise and their time for the installation process. committee, excitement from our parents and kids, volunteer time and support from our local businesses, we can accomplish this goal.